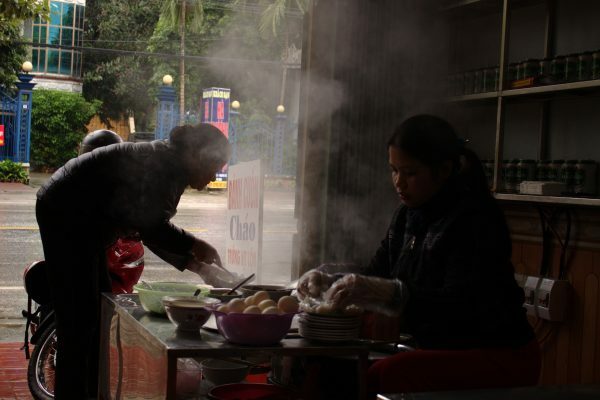 Try These Best Dishes in Ha Giang and You Will Never Forget This Place! Do you believe that a traditional plant widely famous for its toxicity can be cooked into a regional cuisine? If you don’t, think again. 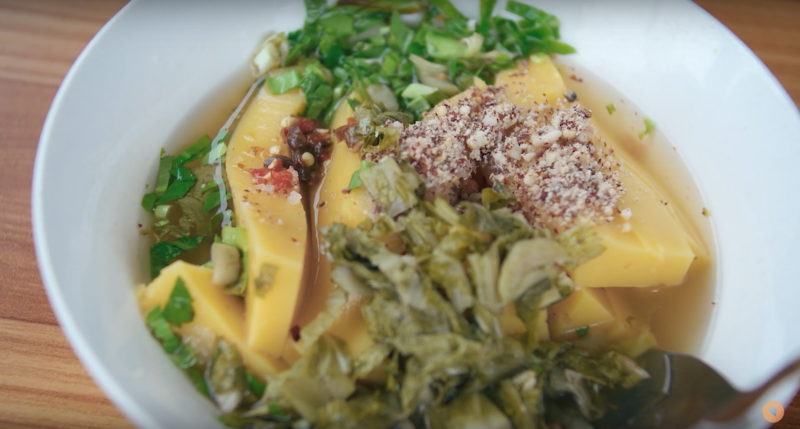 Here in Ha Giang, it’s possible and there’s even more unique foods that comprise this colorful food culture. When you Google “Places to visit in Northern Vietnam”, I’m sure Ha Giang will pop up in most of the results. This borderline province is wildly famous for its spectacular natural scenery with stone plateaus and grand waterfalls that can literally take your breath away. Not to mention the incredible winding roads across the region making you feel as if you are reaching out for the horizon. The scenes are arguably some of the most beautiful you will ever see, but what about the food? 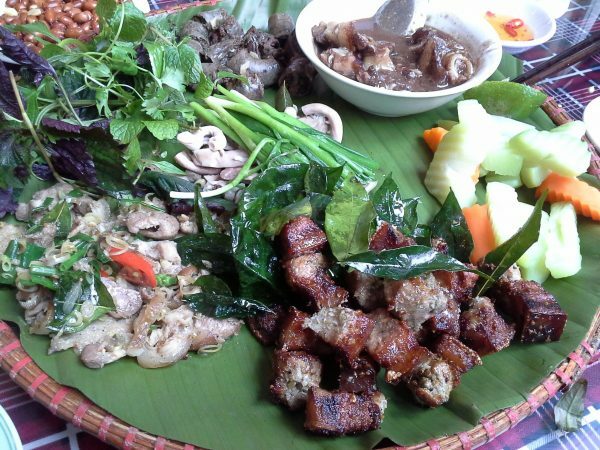 Let’s find out below for the very best dishes in Ha Giang you’ll ever try! 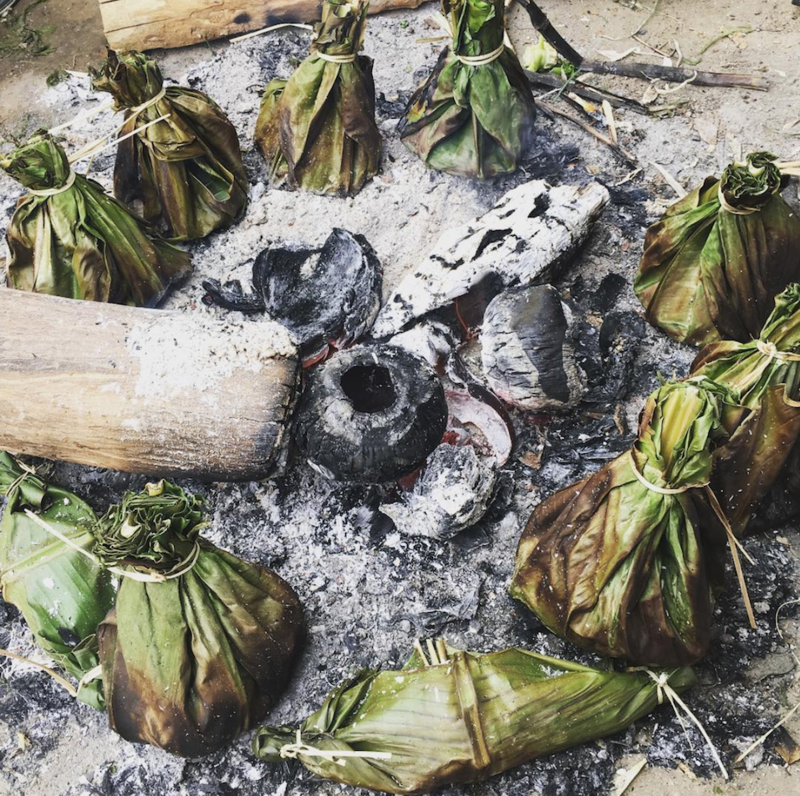 This is a traditional dish of ethnic communities in Ha Giang. 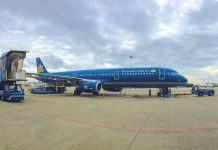 It’s striking because it has such an interesting name; it might confuse a lot of Vietnamese people, and even more foreign travelers. The dish’s main ingredient – au tau – is a tuber root of Chinese aconite or also known as wolfsbane. Mountainous terrains and climate conditions in this northern city are an optimal natural habitat for this plant. Here is a fun fact for you, au tau is one of most poisonous plants in its flowering breed, with immediate symptoms in just about one hour. But don’t worry, it should be perfectly edible and delicious if properly treated and prepared. Skillful au tau cooks in Ha Giang know just how to do it. A 30-year experienced vendor and owner shared her secret: soak the tubers in rice water and then boil them in low heat until they slowly become mushy. This is when you know they are detoxified and will serve your hungry stomach the best. Cooked with carefully selected rice and pork trotters, au tau congee has a slight brown color and is topped with aromatic herbs. Because of its “best-served-hot” feature, add a rousing touch to the dish by cracking a raw egg and let the heat do its job. After all that and maybe some more ground pepper and chili to taste, you will have an extraordinary night to remember. 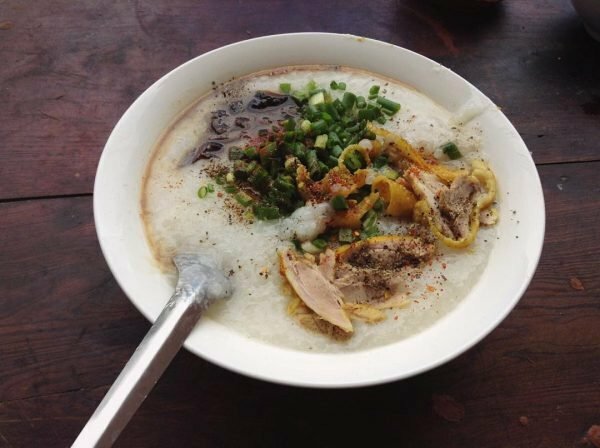 I believe a hot bowl of au tau porridge can shoo away not only your hunger but also any unfavorable feelings you’re experiencing. Ha Giang is one of the contiguous provinces to China in Vietnam, making it a home for over four ethnic groups and therefore, carrying a remarkable inbound cultural diversity. If au tau gruel is widely popular among every Vietnamese community in Ha Giang, grilled alga is considered a specialty of the one and only Tay – the second largest ethnic group here. 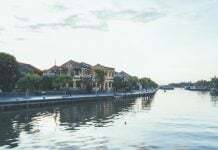 Stone alga is not commonly used as food by most Vietnamese, but when it comes to the Tay’s belief, it can be just as delightful as other standard cuisines. Every dish has its own key to set off the most special version and grilled alga is no exception. Given that this is a delicacy, it requires a certain amount of care, knowledge, and skills from locals to cook. Starting with collecting fresh alga, choose the youngest plant that has grown for three to four days and wears a green color. After a week or more, these alga will become white and that’s a sign of spoiled food. Next comes the seasoning: you will appreciate the explosion of flavors when alga is mixed with ingredients from the Tay recipe. Lemongrass, chives, and some traditional authentic spices will fuse together and create a flavor twist of moist taste from the water in the plant and an earthy essence from inland ingredients (herbs used to season). Ultimately, grilling is the final touch to flare up all of these flavors and mark another worthwhile experience on your trip to Ha Giang. Stone alga is a seasonal plant and also a traditional cuisine of Tay people so it’s rather hard to find if you’re traveling alone. It’s not impossible, however, because you can always ask locals and they will be happy to give you directions or even offer a homemade grilled alga dish on the house. This dish might seem familiar to those who have visited other northern cities in Vietnam like Hanoi, Hai Phong, Lang Son or even in Saigon where you can easily spot one in countless breakfast vendors on the streets with a sign “Banh cuon nong”. This is because they share one presentation and a few ingredients at first glance. Generally, a standard roll plate includes some rice rolls and a seasoned fish sauce bowl on the side with herbs to taste. However, people in Ha Giang like to spice things up a bit. In their version, they add rice flour mix to raw eggs before pouring it over a heated pan. The thing is, they will not beat the eggs, which makes the yolks more buttery and mushier than ever. Stuffed with ground pork and wood ear, one steamed egg roll will melt in your mouth with a well-cooked side soup. The rolls are rather cool, but the soup is always hot. Dip it in the soup, take a bite, and you will feel a balance in its temperature and flavors. This dish’s name is quite tricky to translate into English from Vietnamese and to this point we should break it down to understand. “Cap nach” means “carried-under-arm” and “lon” means “pork”. These pigs are a mixed breed between wild pigs and Muong pig, so they’re relatively smaller than ordinary pigs. 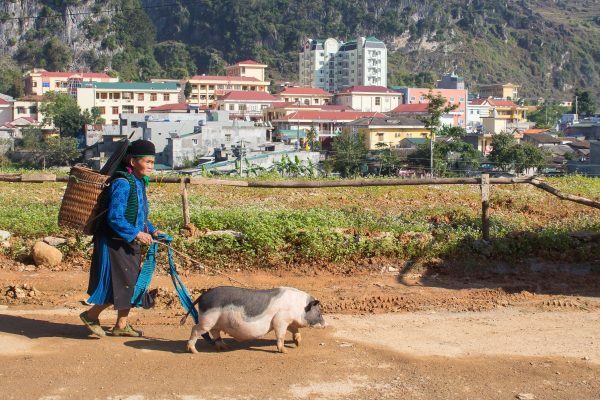 The story behind such a name is that native farmers long ago had often carried these pigs under their arms and placed their stands in Ha Giang’s flea markets to welcome customers. Nowadays, pig farmers are able to produce more pigs to sell in local markets due to the high demand and agriculture development, so “carrying-under-arm” is not the best way to hold and transport pigs anymore. 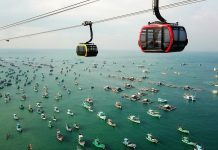 They are now contained in bamboo baskets, which are a symbolic item of ethnic minorities in northern mountainous provinces in Vietnam. And yet, their legendary name still remains through all these years. Carried-under-arm pork can be cooked in many ways: grilled, steamed or stir-fried favorably. However, what sets this cuisine apart from an ordinary pork dish is the pork itself. These pigs are not raised in captivity but free in their open natural habitat, making the pork meat exceptionally firm and lean. With that kind of meat, I’m telling you, you can have your crush’s heart just by steaming the pork with a simple dipping fish sauce with chilli and garlic. This is also the best way to cook carried-under-arm pork, according to locals. But the sauce is different, made with traditional herbs and spices of the local ethnic people. A melting piece of steamed pork dipped with a pleasantly sour and tastily rich sauce will definitely lighten up your day when traveling to this city. Well, all of these above can be both, appetizers and main courses. So now, I present you a dessert to finish your food tour day in Ha Giang: buckwheat cake. In other countries, you may know buckwheat through their processed form as small brown seeds resembling quinoa or rice. 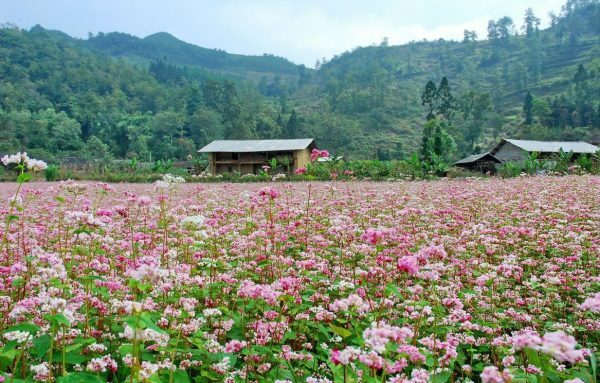 In Ha Giang, you’ll have the chance to see buckwheat in the form of grand flower fields covering the magnificent stone plateaus. Other than pleasing your eyes, buckwheat also makes a great pastry dish if prepared by the hands of the Ha Giang people. 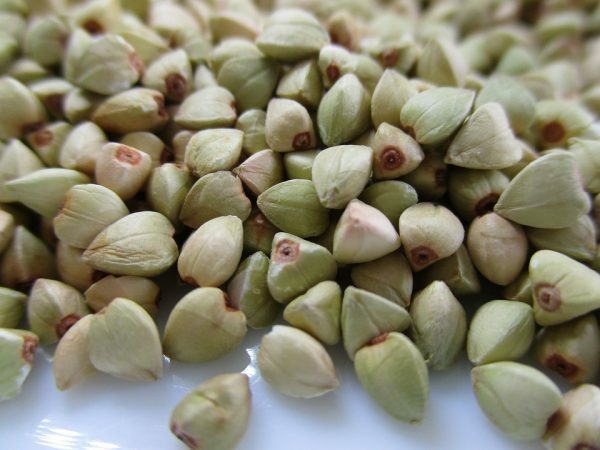 Because of their raw and hard skin, buckwheat seeds must be ground carefully and go through many manual filtering steps to get rid of all the broken and deformed seeds. This will prevent the cake from being rough and thus create an unwrinkled and creamy texture for the cake. Buckwheat cake is often steamed for storage and people will bake them again whenever they want to eat. This extra step adds a beautiful dark brown color to the cake that will make you hungry for more. These cakes are also finished in a charcoal oven! It creates a soft and foamy touch on the inside, balanced with a slight crispness on the outside. This will serve as a perfect snack on your way exploring the city. Get yourself some when you set foot in Ha Giang and I’m sure you’ll want to bring loads of them home! Ha Giang is indeed a place with every suitable trait for an adventurous traveler and jungle lover. From its scenery to cuisine culture, everything is just so wild and free. Add this place to your bucket list and you’ll never regret it! Want to know more about Northern Vietnam and Ha Giang?